After an amazing weekend getaway in Kerala for my best friend's bachelorette, I ended my holiday in the best way possible, by spending all day shopping and finishing it up with a visit to Spa La Vie by L’Occitane. 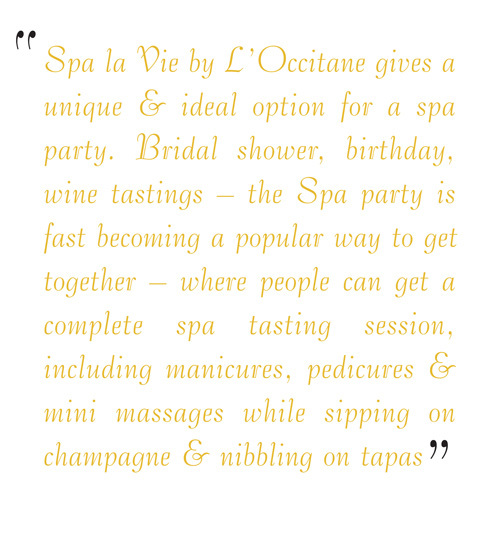 As you may know, L'Occitane is a French skincare and fragrance brand known for its use of herbs and flora from Provence but did you know that they have spas all over the world too? Well, now you do! 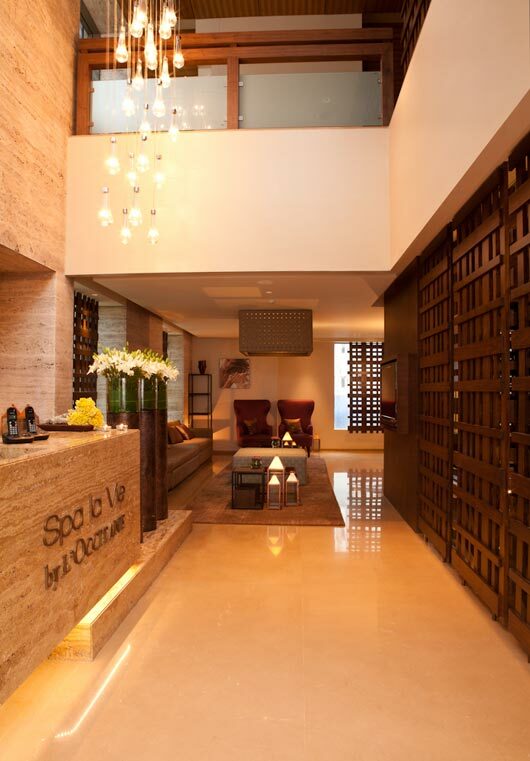 Spa La Vie is an 8,000 sqft Mediterranean luxury spa in Lower Parel, Mumbai. 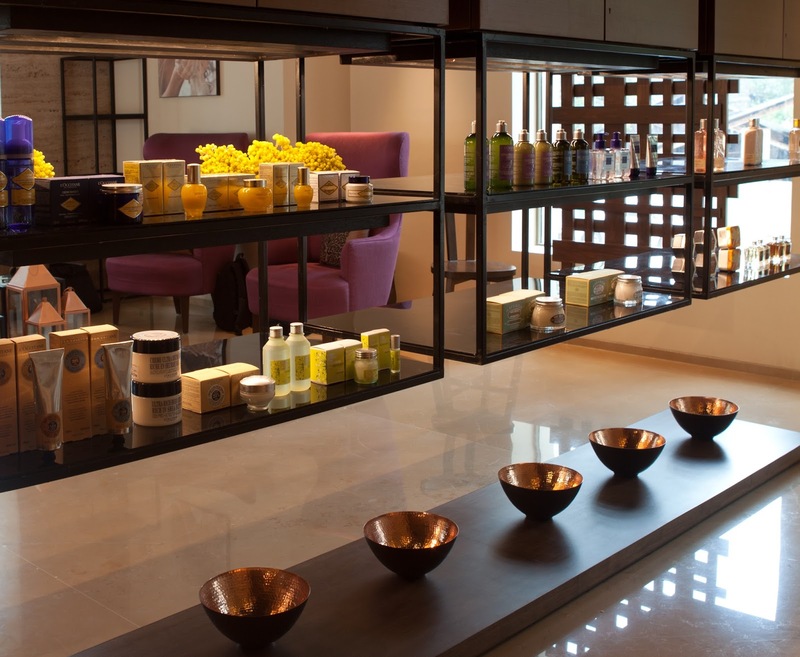 With an expansive area at their disposal, the spa is Mumbai’s largest day spa and also Mumbai’s first true international day spa. 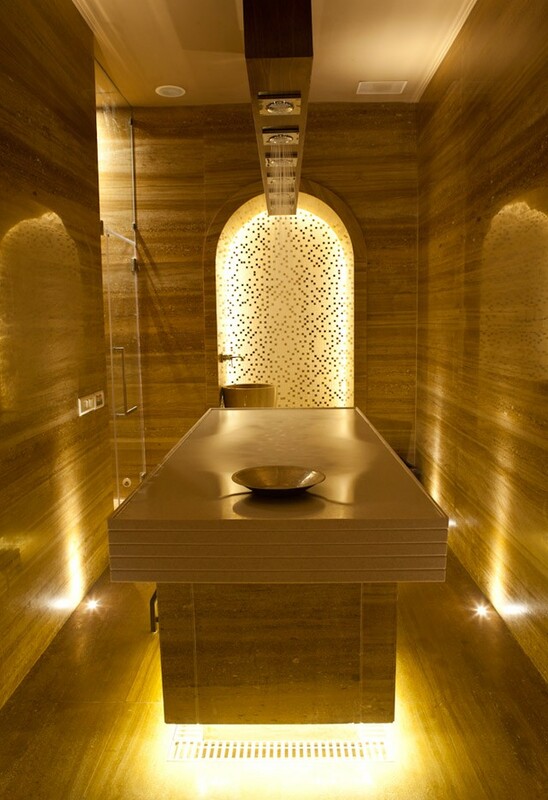 Their highlight is the Hammam, a traditional cleansing and massage therapy – a one-of-a-kind water experience (the only one in Mumbai) that features multiple shower heads and contrasting temperatures to pep up even the most tired and battered body. As I entered the spa on a hot and humid Mumbai afternoon, I felt instantly soothed thanks to the relaxing music and energizing aromas. A pair of Osho slippers were provided to me which instantly reminded me of the rage they are back home in Pune. After a guided tour of the spa, I was settled in the lounge area for a very delicious and detoxifying cup of their signature herbal tea infused with lemon, ginger and honey which detoxifies the body and boosts your immune system. Setting the tone right for the delicious pampering to follow, I had to fill a health assessment form so that my specific concerns could be addressed and the spa therapist could design a customized treatment along with products to be used as per my skin and body type. Equipped with specialists on hand to identify individual needs and tailor treatments accordingly, the experience at this spa is an interactive process. Since I spend long hours on the computer, I had requested for extra time on my neck, shoulders and upper back. The Spa features signature L'Occitane therapies with soaking ceremonies in free standing bathtubs and private steam chambers, present in every treatment room. Treatments offered at the Spa include Massages, Aromachologie Soaks, Facials, Scrubs, Wraps, Ayurveda treatments, Hammam Rituals, Couple Treatments and Manicures/Pedicures. The massage rooms look like mini hotel suites, complete with a mini-bar, couch, shower room and bathtub. 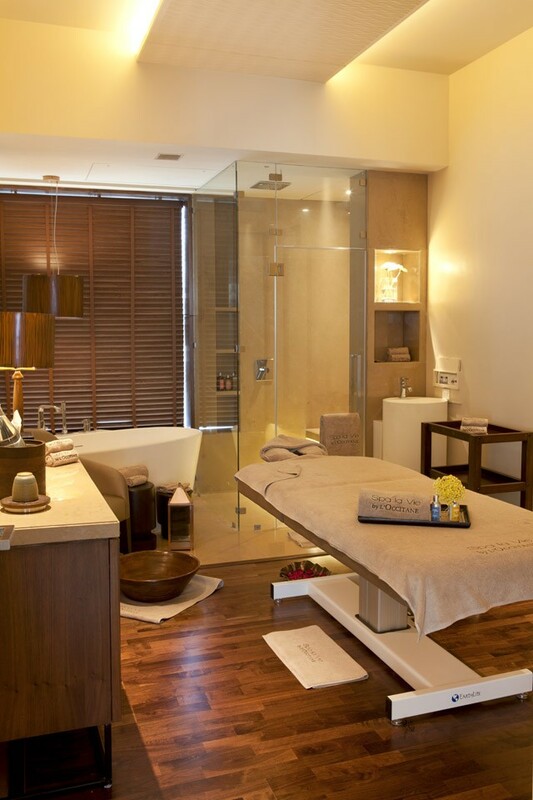 As I was heading back to Pune soon after my spa session, which would be a four hour long car journey, I wanted a treatment that would be more energizing than relaxing so I chose the Revitalizing Aromachologie Massage. This body massage combines gentle Swedish effleurages, deeper-pressure Lomi Lomi and kneading Balinese movements along with the use of an invigorating blend of mint, pine and rosemary essential oils. My therapist was professional and friendly and asked me if I was okay with the pressure level from time to time. As I was curious about the differences between the three techniques used in the massage, she explained them to me each time she switched between them. To begin with, the massage focuses on the left side of the body, the side of the heart, to gently stimulate the acupuncture meridians from head to toe. Then the right side is treated to ultimately release all the energy from the body. Personally, I fell in love with the Hawaiian Lomi Lomi style of massage as it felt soothing and rejuvenating. In the end of the massage, my therapist coated her hands with a refreshing oil (from the L'Occitane grand herbarium of course) and instructed me to inhale deeply. The aroma and blend of this oil would help revitalize my senses and it sure did :) My therapist instructed me not to take a shower immediately after the massage as the oil used should soak in and is very good for skin so I let it stay for a little over an hour and boy was she right. Even the next day, my skin felt velvety smooth and silky! Overall, I was very happy by my experience at Spa La Vie by L'Occitane and was delighted to hear that they are also opening in Pune next year. They are present in a bunch of locations in India (and worldwide) so you know where to go when you're looking for some luxurious pampering or have a spa party with your girlfriends for a fun filled day. This is the type of spa I will not mind visiting you did a amazing job presenting it on this post. Lucky June ;) what a gorgeous place, looks amazing. Great presentation of this gorgeous spa. What a lovely place! I wish I were there right now! Wow, what an absolutely amazing place! What better way to end your holiday, the place is comfortable and relaxing. Wow, this sounds amazing! And it looks even better. How amazing. That looks like a great place to go and relax. So nice! Looks very luxurious! How wonderful the spa looks and know you must have felt relaxed and amazing after that. I always use the L'Ocitanne lavender soft soap and often the haircare - I love that it is natural plant ingredients and the lavender is gorgeous. Great review dear! And how cute place is this! What a beautiful spa place to visit!! I'd love to spend a weekend there! I really need some rest and SPA sounds great! Wow, que bonito y cuanta paz!! wow this looks like such a gorgeous place! looks a very relaxing place! We don't have any of these spas where I live, but they sound amazing and if I am ever visiting it is definitely a place I'd like to go to! The spa looks so calming. I could use a spa vacation right about now!! A L'Occitane spa? Sounds like a dream! I've never been to a spa! You made this sound fantastic. I'm totally in love with this spa!!!! Gorgeous spa dear! Have an awesome day. OMG! This place looks amazing. Do not forget to follow for a chance to win a pair of Chopard Sunglasses ($500.00 Value). Hello, I really like what you teach us today. me what I aim to look and buy for me. How I miss having spa! Looking great and enjoyable spa you have ..The place looks great! Need to find best cheap spas in Manhattan.I want a pampering session. I really need a good massage and pamper myself till the fullest.